Maybe it should be Attack on Time? Or Adventure Attack on Time Titans. Yeahhh AATT! Saw this picture on tumblr earlier, figured I'd share it here for my buds. What are some cool crossover things you've seen? I know pretty much everyone creates any popular show and mixes it with Adventure Time or Doctor Who to try and sell a shirt on Teefury, but that got old pretty quick. But sometimes you just come across quality like this, a nice crossover piece that was made just for fun and pure enjoyment, and I gotta say this is pretty neat. 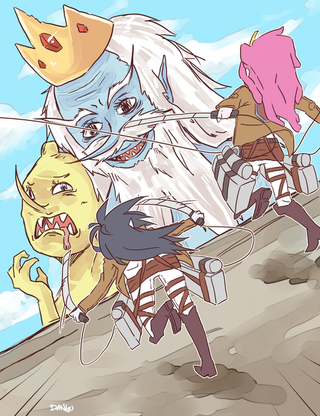 We can also use this as a great way to just start talking about how great both Adventure Time and Attack on Titan is... so GO!